You can configure Spectrum and Cloudflare’s Load Balancing to provide TCP healthchecks, failover, and traffic steering to bring resiliency to your Spectrum Applications. Cloudflare’s Load Balancer can be configured to probe any TCP port for an accepted connection. This is in addition to HTTP and HTTPS probing capabilities. Health Checks are optional within a Load Balancer. However, without one the load balancer will distribute traffic to all the origins in the first pool. With the Health Check enabled, hosts that have gone into an error state will not receive traffic maintaining uptime. This allows you to enable intelligent failover within a pool of hosts or amongst multiple pools. The below image will configure a TCP health check for an application running on port 2408 with a refresh rate every 30 seconds. This can be configured through the dashboard or through Cloudflare’s API. 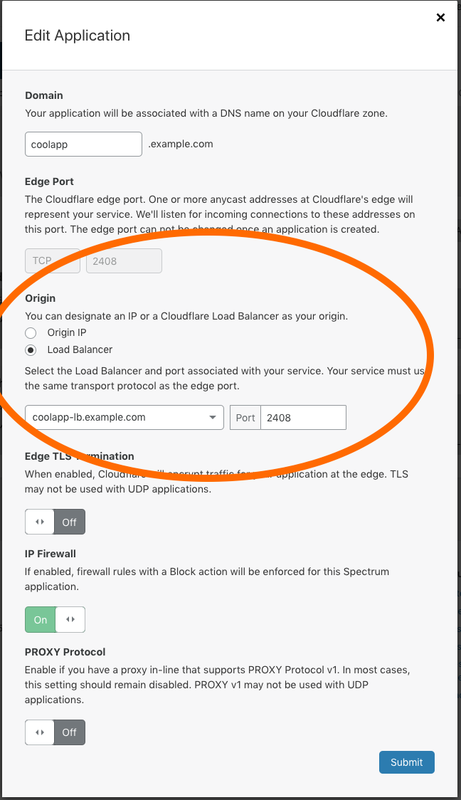 Below is the procedure to enable a Cloudflare Load Balancer with Spectrum using the dashboard. Origin Weights allow you to have origins that do not have the same capacity or if you want to split traffic amongst hosts for any other reason. Weight is configured within a load balancer pool will be honored with load balancing through Spectrum. If configured, Cloudflare will distribute traffic amongst the available origins within a pool according to the relative weights assigned to each origin. For further information on weighted steering, see the knowledge base article. In this mode, the Cloudflare Load Balancer will fail over amongst pools listed in a given load balancer configuration as they are marked down by health checks. If all pools are marked down, Cloudflare will send traffic to the fallback pool. The fallback pool is the last pool in the list in the dashboard or specifically nominated via a parameter in the API. If no health checks are configured, Cloudflare will send to the primary pool exclusively. Dynamic steering is a way of directing traffic to the fastest pool for a given user. In this mode, the Cloudflare load balancer will select the fastest pool for the given Cloudflare Region or PoP (Enterprise only) through health check data. 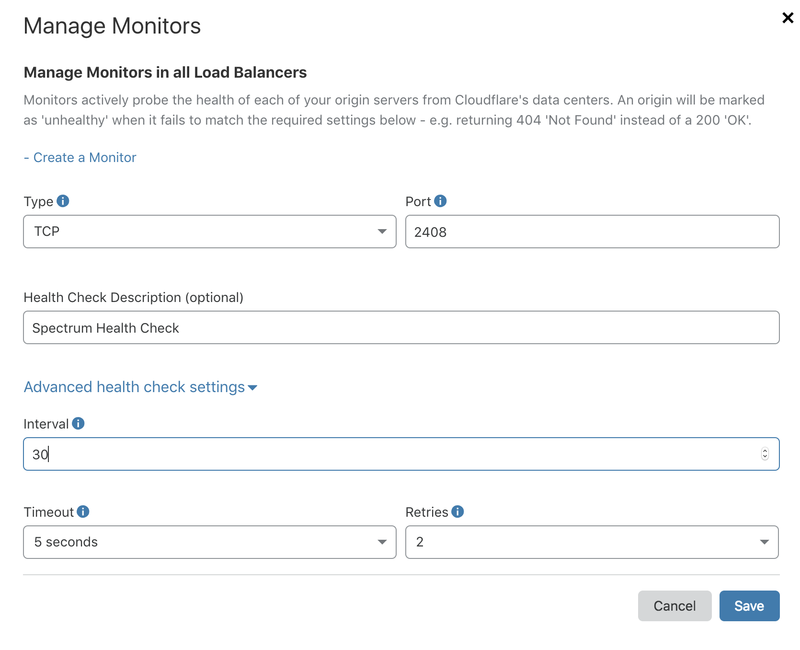 If there is no health check data for a given colo or region, the load balancer will select a pool in failover order. It is important to note that with TCP health checks, latency calculated may not be representative of true latency to origin if you are terminating TCP at a cloud provider edge location. Geo Steering allows you to specify pools for a given Region or PoP (ENT only). In this configuration, Cloudflare will direct traffic from specified Cloudflare locations to configured pools. You may configure multiple pools, and the load balancer will use them in failover order. If this steering mode is selected and there is no configuration for a region or pool, the load balancer will use the default failover order. You will need to have both Load Balancing and Spectrum Enabled in your account to use this functionality. You will need to create a Load Balancer on your Cloudflare managed zone. You can follow instructions on how to do so by following this tutorial.